Getting up for an early run isn’t something I usually do. 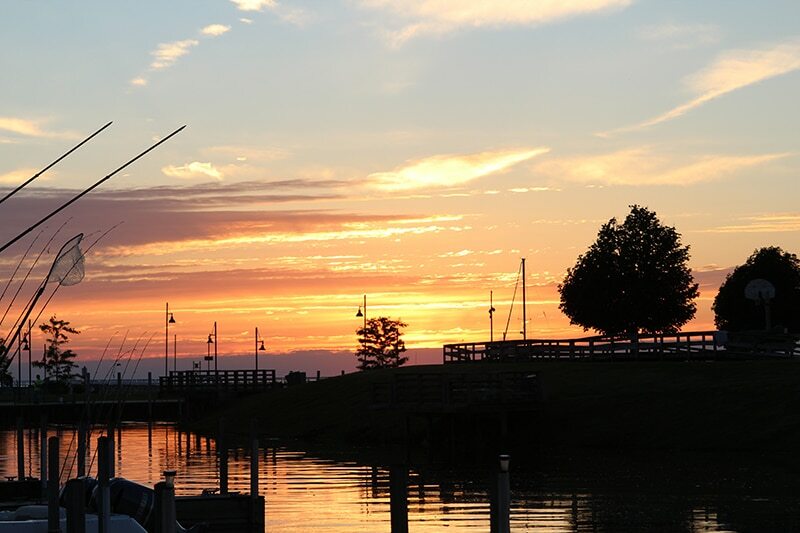 I prefer to do my running at night, but with beautiful sunsets and so many incredible breweries and restaurants in Port Austin, my summer evenings were occupied. I pulled on my running shoes and popped in the earbuds, then set out through the quaint beach town towards the lake. Small lake communities like Port Austin, Michigan remind me of my childhood. My grandparents lived across the street from Lake Huron in Kincardine, Ontario and I spent many days walking on the beach and playing in the sand and water. Families come from the city as a distraction from their busy lives, so at least half of the population doesn’t live there year-round, yet everyone acts like they are old friends. I found the same atmosphere as I jogged past a row of cottages where several people were enjoying their morning coffee on their patios. They waved and smiled while I ran by, making me feel welcome in their lake paradise. As I approached the marina, I passed Pak’s Backyard Café and Beer Garden, where I had enjoyed a craft brew the night before. Walking his dog nearby was the owner of the café, and we stopped for a friendly greeting before going our separate ways to enjoy the morning air. Following my path near the marina, I watched the kayakers on the water and the kids playing in the park and thought of what a peaceful way that must be to start each morning. 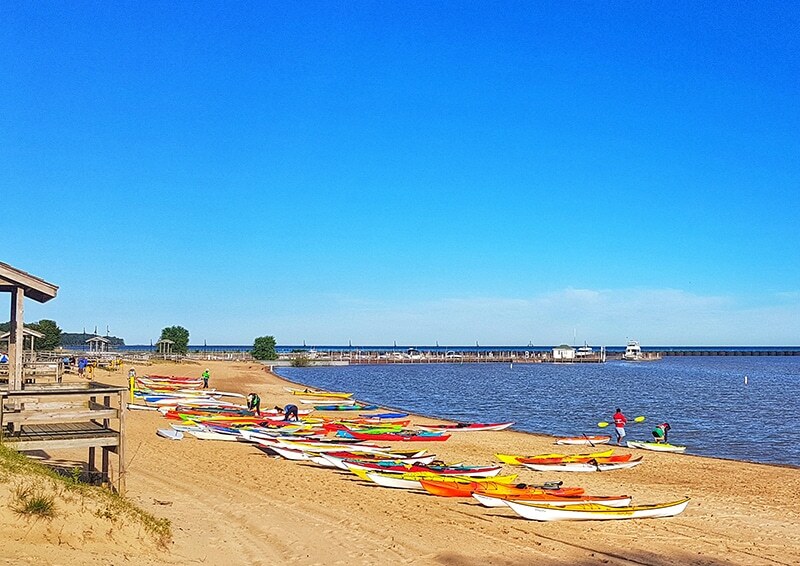 Any day spent on the water is a good day, and in Port Austin the opportunities are boundless. Eager for our morning tour of the Port Austin Farmer’s Market, I circled back through the downtown to head back to my hotel. As I ran by, I had a quick sneak peek of the market with the fresh fruit and vegetables, handmade furniture and countless gift ideas. Visible from the street was the distinctive produce truck from Bird Creek Farms, a unique and delicious stop we made for dinner the day prior. It is there that I enjoyed some divine fish tacos and craft brew from my seat on the patio overlooking the gardens. I tried to catch a glimpse of any of the hospitable family members who own Bird Creek Farms, but they must have been hard at work setting up for the market. Upon reaching my hotel, it struck me how rare it is to spend just two days in a town and be able to not only recognize people and places in the community, but look forward to seeing them. Every business owner that we met in Port Austin shares the same sense of community and responsibility to their town. They are passionate about the area and everything it has to offer. They customize their businesses to meet the needs of the locals and the tourists, with the common goal of seeing Port Austin continue to grow and thrive. It was refreshing to be a part of, if only for a short time.